to honour the research done by Michael's late Aunty Rita on his (and her) LANCHBURY Family Tree. Sarah LANCHBURY and Hubert CLEMENS were married at St Clements Church on 3rd June 1877. This posed photograph was taken by William DOWTY (see note below). Michael's Great Grandmother was born Sarah Ann LANCHBURY in Draycote, and baptised on 24th June 1855 at Blockley, Worcestershire. 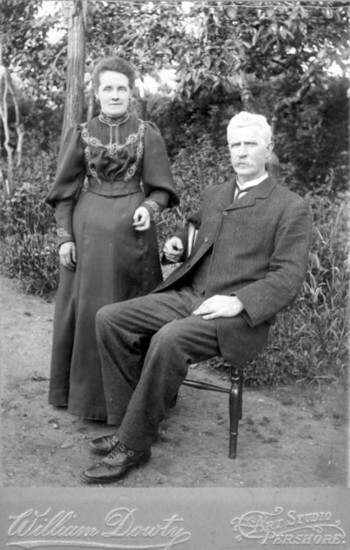 She married Hubert CLEMENS, a coal merchant, at St Clements Church on 3rd June 1877, and later died in December 1920. Sarah's parents were Jonathon LANCHBURY, a railway man, and Ellen STANTON. We know that they were married on 6th May 1855 in Blockley, and that their other children were Henry James, born in 1859, Florence Lucy, and Edith Stanton. It is believed that one of these girls went to America. Ellen's will was dated 4th March 1881, so presumably she died a little before that date. Jonathon's father was named James LANCHBURY, a baliff of Throckmorton. Shown here is a photograph taken at the CLEMENS family home, 133, High Street, Pershore, Worcestershire. The home was purchased in 1886 by Hubert and Sarah and was owned by the family until 2004. The photograph was taken circa 1901 and all in the photograph are family members except for the man with the shovel and the man by the horse. The young lad in the centre, between the 2 girls is Michael's Grandfather, Charles, who was born 5th November 1894. Sarah LANCHBURY is 2nd from the left. 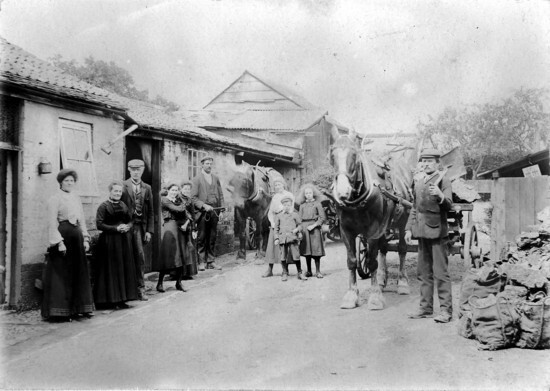 Michael writes that the family business was coal, delivered by the horses and carts in the bags on the right. His grandfather was very much into the modern day technology and built hot air balloons, wireless telegraphy receivers and gliders, all before 1914. To test one of the large gliders he decided that the family cat should be used as a 'test pilot'. "I understand the cat survived its experience OK but that my grandfather had a considerable 'ear bending' and possibly more from his mother Sarah!" This picture shows Michael's Father 'Jim', aged about 7 in the middle at the back of the photo. On his left is Michael's Grandfather. 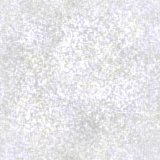 On 10 December 2005 I had an email giving some valuable new information on the photograph of Sarah and Hubert. Bob Dowty, a relative of the photographer wrote "Hello May, Just a minor correction for your site. The photograph of Sarah Lanchbury & Hubert Clemens is almost certainly by the father of the founder of the Dowty Group rather than his brother. 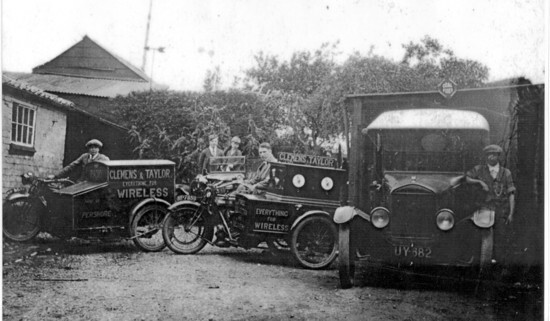 The photogaphy business was founded in Pershore by William Dowty, father of Sir George Dowty, and he ran the business until about 1910 when it was taken over by his sons William Ward Dowty & Robert Dowty who traded together in Pershore, Worcester and Cheltenham until 1914/15. After the war Robert moved to the Isle of Man whilst William Ward carried on the business in Worcestershire being eventually succeded by his son Michael who published a number of books about the Worcestershire area. Judging by the card used for the photograph and comparing it to others in my collection I would think it dates to the late 19th / early 20th century and is therefore almost certainly the work of William senior. Hope this is of some interest. Kind Regards, Bob Dowty"
This is certainly very interesting and helpful Bob. Many thanks for making contact and sharing your knowledge!